What if you had a black skull Archon in a mixed dark elder detachment? A mixed detachment simply cannot be done anymore if you wish to benefit from the obsession rules. Nor can the Ynnari take Saim-Hann spears and benefit from the craftworl attribute, as they are a part of an Ynnari detachment, not craftworld detachment. I was always a little baffled that people thought you could use it when they didn't have a BH detachment. They aren't looking for the Craftworld Attribute bonus here. What has generally happened with Ynnari Shining Spears is they have a Craftworlds Detachment, typically Alaitoc, unlocking access to Craftworlds Stratagems, including the Saim Hann Stratagem that allows advance and charge. Then in a Ynnari Detachment, which doesn't benefit from a Craftworld Attribute, they would have some Shining Spears tagged as Saim Hann, and therefore be able to have a valid target for the Saim Hann Stratagem. "Also note that the only requirement to have access to Stratagems is that you have a Detachment of the appropriate Faction." That seems to suggest you only need a Drukhari Detachment to get Agents of Vect, or a Craftworlds Detachment to get the Saim Hann Stratagem. Are we meant to read "appropriate Faction" as including subfaction too? I think we should, but they haven't written the rule to say that. But that is nonsense that should not fly, as due to the Ynnari keyword, they gain no benefit from the Craftworld Detachment rules - being of Saim-Hann faction is one of said benefits. An Ynnari detachment has Ynnari keyword and Ynnari faction - and that's it! It is possible to arrive at a difficult conclusion only if one does not read the rules in the codex. "If a Detachment includes Ynnari units, it is no longer a Drukhari detachment and will not gain any of the abilities listed below." The abilities being: Vanguard of the Dark City, Raiding Force, Drukhari Obsessions (one of them being Kabal of the Black Heart), Blades for Hire. For Craftworlds, those abilities are: The Path of War, Craftworld Attributes (one of them being Saim-Hann), Heroes of Legend. I really don't know what kind of lawyer you need to get around this with Ynnari now with the soup no longer being a thing, and each detachment needing a clear marking of who they are to be considered Battle-forged. Same goes for Kabal of the Black Heart. Read the wording on how CWE Craftworld Attributes can be used and you'll see why, they worded the traits WAY to open ended and you can mix/match with Ynnari to still use Attributes/stratagems etc..
Then look at DE Obsessions wording on the rules. Its clear GW knew they messed up and decided to make sure DE was more in tone with how they wanted it to work. While yes, the Craftworld Attributes definition itself differs and is a bit more loose (you can write down the Craftworld for the unit), the paragraph detailing the Ynnari keyword effects explicitly states that it does not benefit from Craftworld Attributes - it simply does not gain that ability, and thus, it is utterly irrelevant what's written there because the Craftworld Attributes paragraphs do not apply to an Ynnari detachment, period. Based upon this picture it seems very clear to me that GW doesn't intend for broad faction detachments to unlock specific sub-faction detachments post-FAQ. Like, you can still argue that it's not official official until it's clearly written in a revised FAQ, but I imagine that most people are going to adhere to this way of playing things now. Which is fine - it makes considerably more sense this way and is honestly how I thought the rule worked until the Ynnari/Saim-Hann shenanigans started happening. A saim-hann shining spear unit in a ynnari detachment uses saim hann strategem (warrors of the raging winds) to shoot and charge, even if they advanced. They can use this is there is a craftworld detachment in the army in another detachment slot. GW needs to hire the team from the Yu-Gi-Oh card game to write their rules. Those guys fit a damn contract onto half a piece of cardboard and it makes sense. Well, in regard to AoV, it's pretty much written so that any misconceptions about who it is available to should not arise. Have to agree with that statement. It would be better if their FAQ answer didn't use vague language like 'appropriate Faction' and instead explained subfaction specific Stratagems require a Detachment of that subfaction. 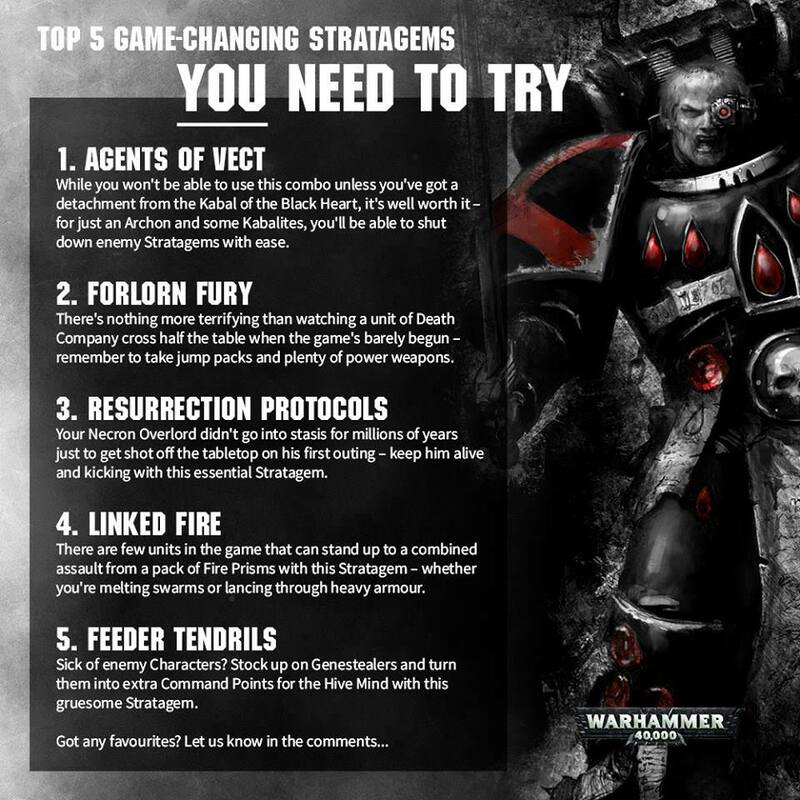 Despite that, GW has made the intent fairly clear with this kind of example around Agents of Vect. It should mean you need a Black Heart Detachment to get Agents of Vect, or a Saim Hann Detachment for Warriors of the Raging Wind. That feels like the right outcome to me. Same, it's pretty clear to me that the intention of the stratagem is that it can only be used in an army where you have a black heart detachment. I understand where the rules lawyers are coming from since yeah there's no incredibly specific wording enforcing that, but still it's really not a surprise that the use of the Black Heart stratagem requires having Black Heart units. While the community folks aren’t at all the rules team, they did intimate they did their best to pass this on to be officially addressed. I am okay with treating Agents in a unique way as the only stratagem requiring a detachment, of only to avoid arguments. The alternative interpretation is too horrifying to contemplate. As it is, this begs the question if a detachment with Black Heart Kabal and some mercenaries qualifies for the stratagem. Blades for hire only allows them to benefit from an obsession, it doesn’t modify faction keywords which is what establishes a detachment’s characteristic. If subfactions must be pure to get their specific stratagem, that screws mixed Renegade Astartes, Chaos Daemons, Guard with regimental advisors, and Drukhari with mercenaries. If only we had playtesters that could communicate with the rules team to sort out issues like this before the codex released. I don't know why this could be unclear. If you want to use that BH or shining spear stratagem, you need a detachment of that faction. Meaning black heart or Saim Can. If you put black heart units into a mixed Dark Eldar of flayed skull and black heart for example, this mixed detachment has the keyword dark Eldar and not black heart and flayed skull. Ergo you can't use that agents of Vect strategem. Same with craftworld or mixing dark Eldar with craftworld and/or Ynnari. Everything else feels like WAAC rules abuse. Because it was unclear enough that literally everyone on the planet assumed before the DE codex that you only needed a detachment to unlock every stratagem associated with the faction and that subfactions were snowballed into that. "Everyone" being the people incapable of/knowingly not reading the paragraph where it clearly states that an Ynnari detachment does not benefit from any further rules following said paragraph? This is not the case of the rules being wonky. This is a case of people being wonky with how they choose to read what's written and interpreting things to their advantage. It's no longer 5e with FAQs coming out once in a blue moon. This is an edition where the intent matters and such passages can be expected to soon be corrected. This isn't something that can be playtested, because how the hell do you simulate players not reading the parts of the rules they're not feeling like reading and just winging it? Uh huh sure everyone read it that way. That's why the winning list of the LVO took advantage of this long standing interpretation. Because every judge their had their pants on their head and not at all because the rules aren't clarified. The paragraph above all of the Stratagem slabs in the Codices stated that if your army included a ASURYANI or ADEPTUS ASTARTES or ASTRA MILITARUM Detachment, you gained the ability to spend Command Points to activate the following Stratagems. Following from that, there existed Stratagems that required you to select a specific unit as its target. i.e. the Incubi Stratagem in our codex, the Saim Hann Stratagem and so forth. 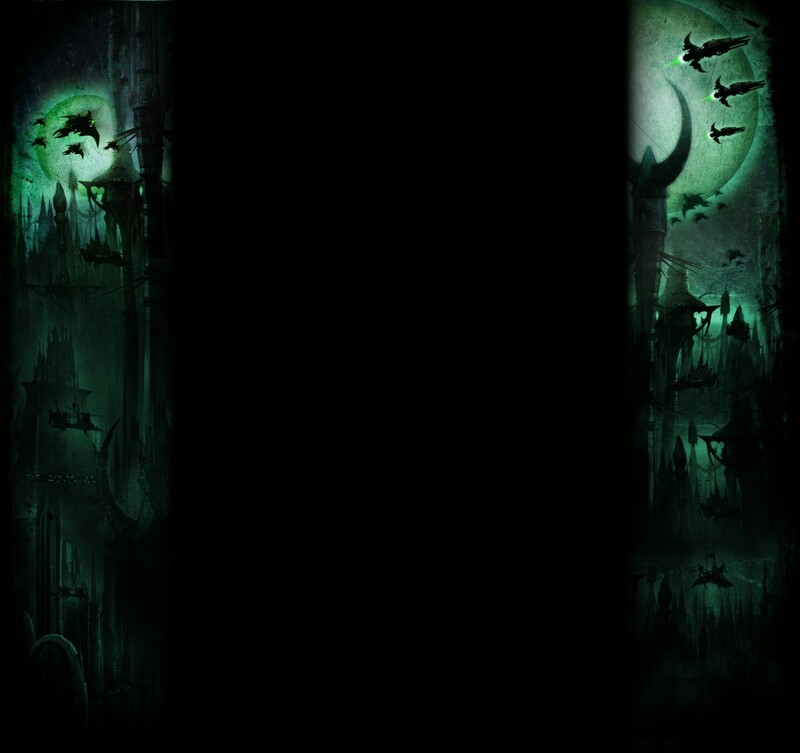 In the cases of subfaction specific Stratagems like the Flayed Skull, Obsidian Rose and Cursed Blade strategems, there is nothing in the codex preventing a solely Black Heart or even <HAEMONCULUS COVENS> army from using any of them. No universal rule, no codex specific restriction, but the statagems are self-regulating as they require you to select a friendly FLAYED SKULL, OBSIDIAN ROSE or CURSED BLADE unit as the target of the Stratagem. The same can be said of the Saim Hann Strat. It's self regulating, as a solely ALAITOC Force could not make use of the stratagem, and a solely YNNARI force would not have a CRAFTWORLDS detachment to gain access to the stratagems. The point of contention arises when you have both a YNNARI and CRAFTWORLDS detachment in the same army. Your ALAITOC detachment gives you access to the Saim Hann strat, though it gives you no valid targets. Your YNNARI detachment does not give you access to the stratagems, but might contain a SAIM HANN unit, giving you a valid target for the stratagem. Thus allowing you to use it. Neither of these issues have been FAQ'ed beyond the 'only requirement...' statement and so the above reasoning still holds true. Personally I think it should have been rewritten to have a Black Heart Archon as its focus. It is incredibly frustrating when such insane searching for loopholes forces there to be FAQ questions such as "Can my fortification be a warlord?" or for GW explicitly needing to state that a space marine force called "Hive Fleet Leviathan" does not benefit from Leviathan special rules. Is it truly necessary for the stratagem to have written "Kabal of the Black Heart obsession only" right below "Kabal of the Black Heart Stratagem"?